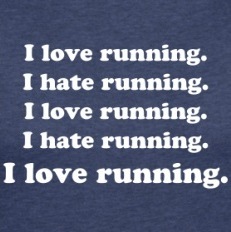 Anybody that has picked up running as a sport has felt and expressed all of the above statements and more. Growing up, I played nearly every sport imaginable: soccer, basketball, football, floor hockey, tennis, racquetball, hacky-sack (is that a sport? ), skiing, snowboarding (a bit), biking, etc. And although many of these sports involve running, some of them quite extensively, running is not the goal. It is one of the many components of that sport. spiritually relevant Create a free website or blog at WordPress.com.